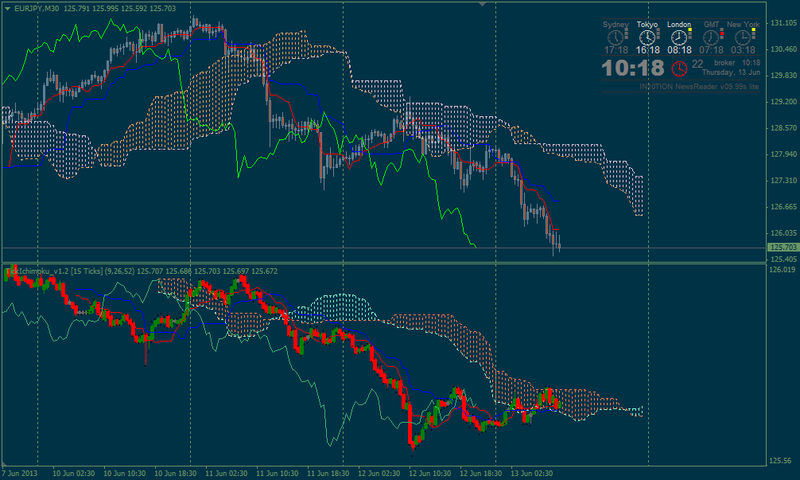 As TickIchimoku_v1.2 indicator indicator was uploaded by Igorad for Premium Trading section - read here so watch this video about Ichimoku indicator in general and how to use it. Invented before World War II by a Tokyo newspaper writer who called himself “Ichimoku Sanjin” (a pen name meaning “a glance of a mountain man”), ichimoku charts are becoming a popular tool for Japanese traders once more, not only in equities but also in currencies, bonds, indices, commodities, and options. Literally, ichimoku means “one look”; a chart of this style is referred to as ichimoku kinkou-hyou — the table of equilibrium prices at a glance. Ichimoku’s guidebook on the charts finally appeared in 1968, long after the newspaper writer, whose real name was Goichi Hosoda, developed the technique. Only now, in the early 21st century, are western traders really beginning to understand the power of this charting system created by one Japanese newspaper writer before the second World War. I will upload some more about Ichimoku on this thread soon: articles, systems etc. More to follow. From Stocks & Commodities V. 18:10 (22-30) - attached in zip zile. This video is designed to give the trader an introduction to the Ichimoku Cloud, a popular Japanese trending indicator with high accuracy in all global markets. Things to do when Losing Money Trading! If you find that you're losing money consistently the first thing to do is to stop trading! And try to resume trading with smaller trade sizes. Losing money is often unavoidable in spread betting. Find reversals using the Ichimoku Cloud and the Kumo Break method. Learn some key tactics on how to find key reversals trading Kumo Breaks. A moving average of the highest high and lowest low over the last 9 trading days. A moving average of the highest high and lowest low over the last 26 trading days. The average of the Tenkan Sen and Kijun Sen, plotted 26 days ahead. The average of the highest high and lowest low over the last 52 days, plotted 26 days ahead. The closing price plotted 26 days behind. The area between the two Senkou Spans is called the Kumo (Cloud). The Tenkan Sen, also known as the Turning or Conversion line, is a moving average of the highest high and lowest low over the last 9 trading days. It is primarily used to measure short-term momentum and is interpreted in the same manner as a short-term moving average. A steeply angled Tenkan Sen indicates a sharp recent price change or strong momentum, while a flatter Tenkan Sen indicates low or no momentum. 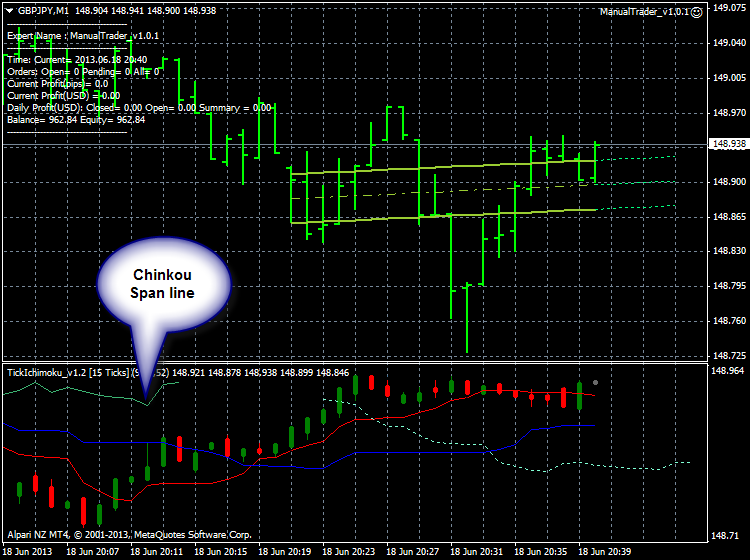 The price breaching the Tenkan Sen may give an early indication of a trend change. The Tenkan Sen is generally used in combination with the Kijun Sen to suggest probabilities of future momentum. (Highest high + Lowest low) / 2 over the last 26 trading days. The Kijun Sen, also known as the Standard or Base line, is a moving average of the highest high and lowest low over the last 26 trading days. As with the Tenkan Sen, the Kijun Sen is primarily used to measure momentum, however because of its longer time period it is a more reliable indicator of trend. A flatter Kijun Sen indicates a range bound price, while an inclined line indicates a trend, with the angle of the line showing the momentum of the trend. The Kijun Sen is generally used in combination with the Tenkan Sen to suggest probabilities of future momentum.